Sailing the Danube River in Austria. Captain Rivers is asked all the time about how river cruising is different from ocean cruising, usually by someone who's a regular ocean cruise-goer and has a rather patronising tone of voice. The common assumption is that ocean cruising is somehow better just because it's bigger. Really? Captain Rivers has done plenty of both and begs to differ. Here are three reasons why he thinks cruising on rivers often beats life on the ocean wave. BETTER EXPERIENCE OF PLACE River cruises take you to places inaccessible to ocean-going cruise ships – not only the interior of continents, but small villages and towns that can only ever be served by small vessels. As a bonus, you can admire beautiful countryside, rather than just open ocean, as you drift from destination to destination. Keep your camera at the ready: there’s scarcely a moment without something of interest gliding past your cabin window: water buffalo working rice paddies, workers harvesting grapes in autumn-dappled vineyards, the pastel-blue towers of a baroque church. What’s more, if you spend time on the rooftop sun deck of your river-cruise ship, you get a 360° view of the passing landscapes. 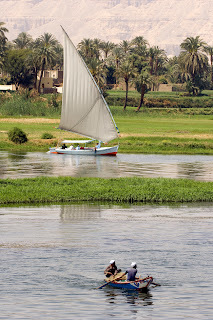 Passing scenery on the Nile River, Egypt. MORE VARIETY You’ll end up seeing more places on a river cruise than a comparable ocean cruise, as there are many more opportunities to go ashore. On a river cruise, it’s the destinations and not the ship that take centre stage. You’ll see the smallest of villages as well as large cities, and enjoy everything from museums and palaces to artisans’ workshops and cellar doors. And isn't that what travel is all about? You wouldn't go overseas just to experience a hotel, and Captain Rivers knows you wouldn't do it just for a ship either. 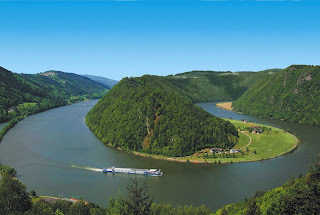 MORE TIME Frankly, one of the pleasures of river cruising is that you can escape the ship so frequently. Days at sea have no equivalent on river cruises: Captain Rivers doesn’t know any river cruise in which you don’t disembark every single day, often for long periods. You spend less time getting to places, more time just being there. How? Cities along rivers tend to be closer together than they are on coastlines. Ships usually tie up right in town centres and stay longer than ocean liners – often overnight. With more time in dock, you can do join your guided tours and have time to explore yourself, dawdle the promenades, sit in cafés or go out in the evenings. Stay tuned: Captain Rivers will be writing shortly about why he thinks the ship experience on rivers is also better than that on oceans. Labels: Austria, Avalon Waterways, Danube River, Egpyt, INTRODUCTION TO RIVER CRUISE INSIGHT, Nile River, WHY RIVER CRUISE?